My son is out of diapers! MY SON IS OUT OF DIAPERS! I am very excited that for the last three weeks my son has worn exactly one diaper per day, the one that I put on him at night. At 2 years and 8 months he is potty trained. I was dreading the training, and had been obsessing about how to go about it. I read about the three-day method, and the take-the-diapers-off-and-see-what-happens method. I even read a little about elimination communication, although I think I missed the mark for that. Honestly, I felt incapable of potty training my son, and kind of inadequate as I had seen countless facebook posts about how other people’s kids just decided upon themselves at 12 months old that they would be wiping their rear on their own. OK, I am exaggerating, but the pressure was on. Every preschool requires kids to be potty trained, and we are ready to send him to preschool in the fall. My son first showed interest in the potty at 18 months but I thought it was too early, and so did our pediatrician who assured me that first-born males usually take longer to be ready. I was also expecting another baby in a few months and I knew that the change could make him regress even if we were successful at potty training. So I waited, and I am glad I did. He was ready to potty train three weeks ago. So ready that it was easy for both of us. So at 18 months my son pooped on the bathroom floor seconds after I took off his diaper in order to give him a bath. I was 6 months pregnant and tired of changing diapers, he was excited to see his poop on the floor, and so I went online and bought a potty then poured over article after article about potty training. Every article I read said to never sit a child down on a potty, so I never did, and the potty sat empty in our bathroom for months, through our move, and then again in our new home’s bathroom. 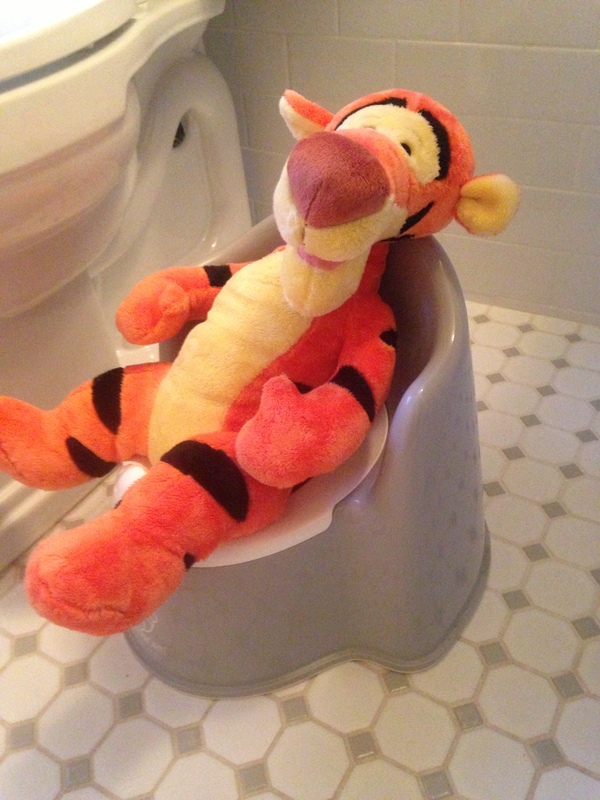 The potty sometimes was used by different stuffed animals, but my son didn’t seem to want to sit on it, and I never pressured him. At a little over 2 years old I started changing his diapers in the bathroom instead of the changing table, and showing him that poop goes in the toilet by emptying all his poopy diapers into it. Before bath time I asked him if he wanted to sit on the potty, he almost always said no. In the bath we have a rubber ducky with a hole in the bottom. I would fill it with water and “tell” the duck to “pee” in the potty. My son thought this was hilarious and often asked me to do it over and over again. He also enjoyed telling the duck not to pee in the tub. In the mean time, my sister potty trained her fourth child, who is a little older than my son. Several times when we were over at their place, or they at ours I would encourage my son to follow his cousin into the bathroom –we are very close in our family. I was hoping that all these little things– most of them had been suggested by my friends– were slowly getting him to understand where pee and poop go. Then one day, and out of nowhere, my son told me he no longer wanted diapers, so I rushed to the store and let him choose underwear. We put them on the next day and it was a complete disaster. We had pee on the floors, and he held his poop for two days, even after putting him back in diapers. I didn’t mention the potty again. This happened three times. We went to Spain over the holidays and in my dad’s house there was a car-shaped potty. My son sat on it as soon as he saw it thinking of it as a toy more than a potty. Every night, before his bath, I would tell him to sit on it, a few times he actually used it. Back in our house I did the same thing I had done at my dad’s, encourage him to sit on the potty before bath time. He again, had no interest. Every time I changed his diapers I wondered if I was doing it all wrong. I again considered the three-day method, but my husband works weekends, and almost never gets two days off in a row. Doing it by myself, with another child at home, would be a kind of torture that none of us would survive. One more time he asked for his underwear, so I told him that he was welcome to wear it, but needed to keep it dry. Amazingly he did. We spent two days at home, then we took a trip to my sister’s where he was greeted with encouragement when we told his cousins that he was wearing underwear. While at my sister’s he had an accident, and I am sure he did because he did not want to interrupt his play. The next day we went to the supermarket with no issues, another day to story time at the library, then to swim lessons (he still wears swim diapers in the pool) and for the ultimate test to the children’s museum. We had no accidents. He also had a fairly easy time using public restrooms. I know he is not 100% potty trained and we’ve had a couple of accidents, including pooping in his pants while holding on to the toilet. As of right now he will hold his pee until he is in a horrible mood or running in place– depending on the time of day. However, this is it. My son is out of diapers, and potty training was virtually pain free. Potty: I have a Baby Bjorn potty, but my dad has this cheapo one that sparked his interest in the whole thing. Disinfectant wipes: left in the bathroom to clean the potty after he uses it. Encouragement: Pee gets 1 gummy, poo gets 2. I buy Annie’s Homegrown Bunny Fruit Snacks. I don’t give him these for any other reason. At this point, he is done with them. Underwear: I let him choose Thomas the Train underwear even though I find them hideous. At the store I tried steering him towards something cuter until I realized that he needed to really like it in order to want to wear it. Basically I learned right there what it means to be a mom. Rules: I have set up some rules to prevent accidents. He has to go to the bathroom before meals and before leaving the house. I ask him if he needs to go upon arrival to our destination, in addition to throughout the day. Patience: I should have believed those who told me that he would get it when he was ready to do so. I am usually very laid back when it comes to milestones, and I certainly encourage independence and try peaceful parenting as much as I can, but the pressure of potty training by a certain date got to me. Once he was ready to do it, he did it. I don’t even think I can take much credit for it. What has been your experience with potty training? I’d love to know. I have another child who I expect I will be potty training in the next year and a half.